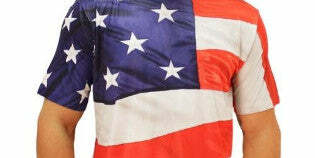 Is It Appropriate to Wear the American Flag as Clothing? Is it appropriate to wear the American flag as clothing? As a proud member of the Greatest Nation on Earth, you have spent your life respecting the flag and all it stands for in our land. When you see someone disrespecting the flag you love and revered so much, it can be unsettling and upsetting, to say the least. When you see American flag apparel, you may wonder if that is a respectful display of this revered flag. There has been some debate about the use of the flag symbol on apparel in the form of everything from bikinis to USA sports gear. So, is it disrespectful or inappropriate to wear the flag as clothing? Let's take a closer look at this important matter. The bottom line is if the item of apparel gear is made from regular material solely for the purpose of apparel, it is permissible. The key is that you shouldn't wear the actual flag as apparel. This is what makes it so confusing for so many people. If a flag is made specifically to be a flag and nothing else, it shouldn't be worn as clothing in any way. If an article of clothing is made to look like the flag in color, that is acceptable because a shirt can never be a true USA flag. Another concern people have is wearing shoes with the American flag on it. We all know the USA flag should never under any circumstances touch the ground as this is a grave disrespect. It is a disrespect to the brave men and women who died for the liberty our county is built on, as well as the virtues our nation represents overall, to let the flag touch the ground which is why many people think wearing a pair of flag flip-flops is a disgrace. However, shoes fall under the same rules as shirts or other apparel. As long as the shoes aren't actually made of a real American flag, you are safe to wear them without any disrespect.